Well unlike the Black Bean and Chocolate Chilli, this volcanic Chocolate and Chilli cake certainly did win me over, in fact I was positively bowled over. Not only is the chocolate deeply satisfying and the chilli heat heart warming, this vegan cake is embellished further with red jewels from homemade strawberry jam. If you click on the picture, you'll see the bursts of red peeking through. This is a oozy, messy and mousse like cake. 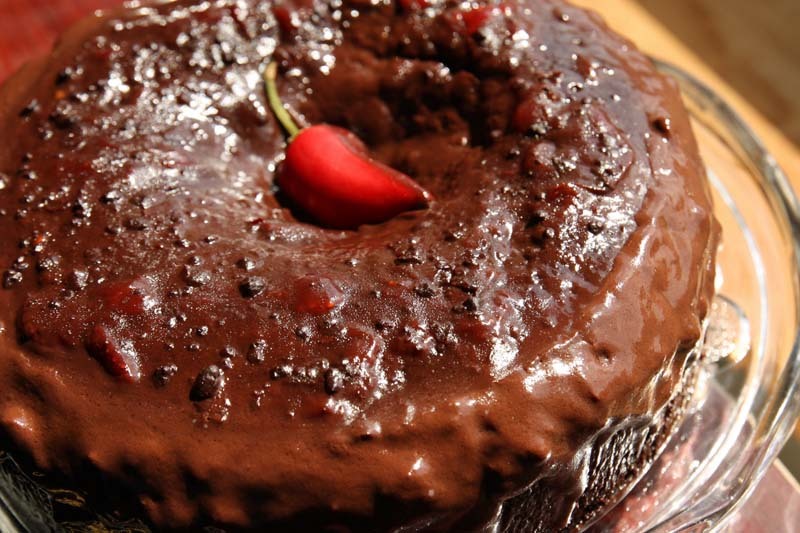 The flavours in this cake will explode in your kisser. Its a bit like spicy ginger cake. There are soft undertones of bitterness, but the warmth of the chilli comes through. 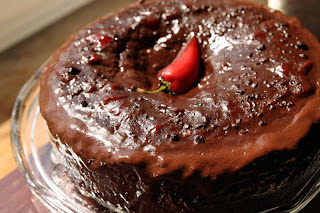 Feel free to reduce the chilli flakes to ¼ teaspoon, but I would not increase the chilli anymore as it will destroy the balance of flavours in the cake. 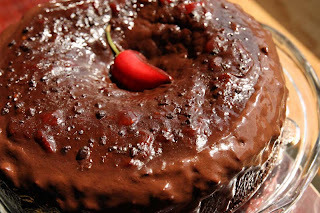 This is also a very moist cake, I'd describe it as luscious too as the chocolate icing-sauce poured over it does not set. Instead it drenches the cake, some of it also remains stuck to the cake like gloss. Its almost like a cream that you'll be tempted to stick your finger in and lick. This Chocolate Chilli cake is inspired by a Raspberry Chilli Cake made by Mike and Isy in the cookbook Another Dinner is Possible. I picked up a copy of this independently published book a couple of years ago at the Incredible Veggie Show in London. This cake is best made the night before. I'd also recommend using a strawberry jam with pulp and bite, a puree would otherwise get lost. Sift the flour, cocoa, salt, baking powder and soda into a large bowl. Mix the soy milk with the oil, then add tot he bowl followed by the strawberry jam, chilli flakes, sugar and vanilla, stirring well. Pour into a well greased tin and bake for 40 minutes. Leave to cool, then spread the jam evenly over the cake. Make the icing by heating the oil in a pan, then frying the spices for a couple of minutes. Slowly add the soy milk and bring to the boil, then stir in cocoa and sugar and mix well. Remove from the heat and leave to thicken for at least 15 minutes, then pour over the cake. Allow to set overnight, before removing from the cake tin. Inspired and adapted from Another Dinner is possible: More than just a Vegan Cookbook by Mike and Isy. This looks really interesting. I love the difference chili makes when combined with chocolate. You make the BEST things. This is so different - would be such a conversation starter and everyone would be talking about it for weeks afterwards. I'm a little bit of a chicken with 'hot' stuff and it would be no good for the kids so I am thinking it would be silly for me to make it... and yet, I really want to. I'll have to wait for a grown up occasion. Steve would die for this. i read somewhere that chocolate and chilli flavor goes well together...but i can c it today...looks so yum...with a kick from red pepper..
My diet doesn't currently allow me to snack on sweets. Psst... I did take a really big taste of that cake with my eyes though! Oh my goodness, this looks - and sounds - incredible! Our homegrown chillies are now dried, so I might use part of one in this cake! i'm always looking for new ways to include spice in delicious baked goods. otherwise, it's just me eating them. john doesn't care for sweets. but if i can kick em up a notch, he loves hot and spicy! i'm on it! Woah that cake looks mad good! My partner really likes Lindt chilli chocolate so this might be a winner with him! Vegan cake with chocolate/chili! Sign me up please :D Looks and sounds so intriguing!! This looks absolutely inviting and decadent, Shaheen. I love a bit of spice in my chocolate and I have some vegan friends who would flip over this. Nice job! Yummy!! That looks so sinful! I want it now! This looks great. I love a bit of spice with my chocolate! Thank you Barefeet In The Kitchen. I sincerey hope you find that grown up occasion to make it. It really does work in this cake. Truly loved your comment - I needed a good giggle. Thanks for the congrats re the mag, but there is background to it. Without sounding ungrateful, the acknowlegement is kind of tokenistic by the mag, and in response to an e mail I sent to them about them, one issue being to be more inclusive of blogs. So sadly it doesn't really feel genuine praise. I am jealous and I mean really jealous of your homegrown chillies. I remember the joy of drying them naturally in the windowsill. Thanks you so so much LaMagicaZucca. for both your comment and for choosing to become a follower. It is very kind of you and most appreciated by me. I do so hope at your John likes this cake - my husband declared it one of his favourite cakes! I will make it again, but the next time will be when I have my brothers around. I hope you can make this for your partner - you'll have to invite some of your mates over too as this is one big cake! :) Its oh so gooey - sweet and spicy - nice! Sinful I don't know about that - but naughty for sure! Thank you so, so much Caroline. Thsi cake is very unusual, but delicious. It was one of the best choc cakes I had ever made,and I really recommend it, but understand why your Dad may not be keen on it. To be honest, choc and chilli combo is quite new to the U.K, even in hot drinks. But not me being of South Asian heritage. We've had choc'chilli brownies that are now becoming popular here. Maybe you should start with a choc'chilli brownie to persuade your Dad. I hope to make a recipe later in the month that you may like to try. Just discovered your reply. That's funny because being from Malaysia I am definitely South Asian too! I guess it's a combination that's not (yet) popular in Malaysia. I'm looking forward to the brownie recipe! In the U.K, people from Malaysia will often be described as South East Asian instead of South Asian as this describes people from the Indian Sub-continent. I hope to make the chilli brownie recipe in the near future, though you may now have to wait until next year.